Following her review of Northern Ballet’s Mixed Programme at The Stanley & Audrey Burton Theatre, TSOTA’s Catriona Chadderton got a chance to meet with Northern Ballet dancer Matthew Broadbent. Born in Zevenaar in the Netherlands, Matthew trained at the Royal Ballet School before joining Northern Ballet in 2010. Cat talks to him about his training, tips and tricks for aspiring dancers and his favourite performance of the season…. TSOTA: Hi Matthew, thanks for taking the time to chat to us. How would you describe your experience studying at the Royal Ballet? MB: I was really lucky to have 8 years at Royal Ballet School under the amazing directorship of the late Gailene Stock. The best thing about the school was being with so many other boys who were all dedicated to ballet. Before this I had been the only boy in my ballet class so it was a great experience to be surrounded by other boys. Boarding school was hard though at first, to move away from home at 11 years old took a bit of getting used to, but looking back on it I realise I was so lucky to have had such a good education, both in ballet but also academically. There were only 12 of us in a class so we got a lot of attention, which was great. It was tough though. We had assessments each year and if we didn’t pass we were thrown out of the school. But I’m really glad I managed to stick it through! TSOTA: How does studying differ to being part of a company? MB: Even when you finish school you are still studying ballet – you will never be perfect so there is always something to work on. But in a company sometimes the emphasis changes. You have performances to work towards and roles to get ready for whereas the aim of school is just to ready you for a company. 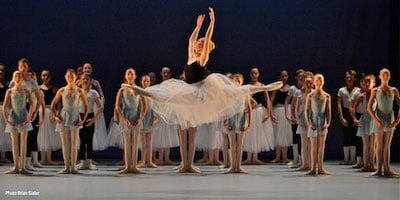 In a company, performances take priority so you use your classical training (we have at least 1hr15 ballet class each day) to prepare yourself, whether that’s working on stamina for a role or nursing injuries. You’ve got to work smart. Use your training to make you better for the shows. TSOTA: How has being part of the Northern Ballet helped you to develop as a dancer? MB: We are lucky at Northern Ballet to have really good training. Yoko Ichino, our ballet mistress, has developed her own ballet technique that helps us really understand our bodies and what to improve on. I’ve also had a lot of experience being on stage, which has been invaluable. I don’t get stage fright and have dealt with so many different situations on stage that I feel much better equipped to deal with the unexpected! Northern Ballet have really invested in me as a dancer and I feel I have improved and matured as an artist during my time here. TSOTA: What advice would you give to young and aspiring male ballet dancers? MB: Don’t give up. It’s hard but if you really want to do it you’ve got to be prepared for the hard work. And stretch. I wish I had stretched more as a child! TSOTA: What extra activities would you recommend to young dancers in their early life to complement their ballet training? MB: These days you’ve got to be good at everything not just classical ballet. With Northern Ballet, I’ve had to use tap skills as well as contemporary, jazz and modern. We are bringing back The Great Gatsby soon and for that we had to learn Tango and Charleston. So don’t ever put yourself in a box. Watch a lot of theatre and movies for inspiration and try to absorb anything you can so you can be as well rounded as possible. TSOTA: Give us a flavour of a day in the life of a dancer? MB: We have two different schedules – on tour and at base. On tour, every Tuesday we will have ballet class at 12pm then do a full technical rehearsal of the show we are about to perform, before opening night. We do 7 shows a week and on the days when we only have 1 show we rehearse for whatever we are doing next in the morning. Sometimes we can rehearse 2 different ballets in the morning before a different show at night. At base we start at 10am with ballet class and will have rehearsals all day until 6.30pm. It’s a busy schedule! TSOTA: We’ve come to the end of the season now, how has the season been for you? MB: It’s been great. I’ve enjoyed the roles I have done this year and in January we toured China. We also got to work with the American choreographer Lar Lubovitch which I enjoyed a lot.My favourite performance was Lubovitch’s Concerto 622. We performed it at the Royal Opera House’s Linbury stage as well as in our own theatre at Northern Ballet. I danced in the trio and it was such a fun, jovial thing to dance, really different to what we were used to. I enjoyed that a lot. Credit: Concerto Six Twenty-Two. Photo onEdition. Broadbent 2nd from right. TSOTA: How do you mentally prepare for a performance? MB: I don’t have a routine or anything I do each time, but I normally have quiet time before a show, before a warm up. Afterwards I either read, watch TV or write to take my mind off ballet and settle back down ready to go to sleep. TSOTA: How important is it to withhold a balanced diet – is it hard to maintain while on tour? MB: We are athletes so it’s important to eat healthily. On tour it is hard. We eat at weird times and in some cities it’s hard to find food after a show. I always like staying in places with a fridge, it makes life easier! But it is very important to make sure we eat enough good food. You’ll soon know about it if you don’t eat enough or eat badly as your performances will suffer. TSOTA: Do you have anything that you swear by? MB: Clarins make-up remover. It’s the only thing that takes my make up (and wig glue if I’ve used a wig) off without destroying my skin. And the occasional Cadburys Dairy Milk! TSOTA: How will you be spending your summer? MB: I always make sure that I make the most of my summers as we have so little time off during the year. So I will be going on holiday with my parents to the USA and Canada and then going to Portugal with a friend. I love travelling so I love exploring during my summer. And stocking up on vitamin D! Visit www.northernballet.com for more information on the company and follow Northern Ballet on Twitter @northernballet.